With the Easter holidays right around the corner, Silverstar will be turning the Square into an Easter Playground for some much-loved family fun. From Saturday 1 April to Monday 17 April 2017, the Easter Playground will be packed with fun-filled activities for children of all ages to enjoy. Some of the child-friendly entertainment will include a soft play park, train rides, pedal karts on an inflatable track, water slide and buskers. The Easter Bunny will also be making an appearance on certain days, with treats for the kids. For those who prefer spending their time watching movies, the Easter Playground will have two free family movie screenings. On Friday 14 April, guests can catch the screening of HOP and on Saturday 15 April, the Rise of the Guardians. “During the holidays, parents are always looking for great family-friendly activities, and Silverstar has made sure to cater to those needs. 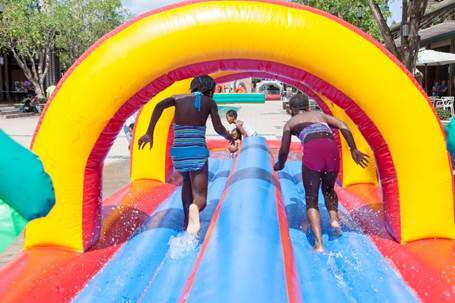 The best parts about the Easter Playground is that it’s not age specific and entry is free, which does not limit who can join in on the fun at the Square,” says the Silverstar Marketing Manager, Sanele Ntombela. Guests can also enjoy great food specials at Publicity Bar&Grill. The gastro pub offers guests live entertainment every Friday and Saturday, along with a mouth-watering menu which includes Eisbein, steak, gourmet burgers and much more. The Easter Playground at The Silverstar Square started from 1 April to 17 April 2017, from 10:00 to 17:00 daily. Entrance is free for everyone.